We’ve been told that red wine, blueberries, and other fruits and juices are good for our brains, but how do they help? Many fruits, but especially dark berries and grapes, contain flavonoids, which are phytonutrients – chemical compounds found in plants. Phytonutrients protect the plants and keep them vital. When we eat flavonoid-rich foods, we derive protection and vitality from them, as well. 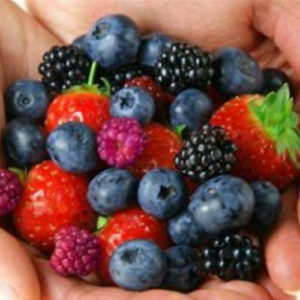 The flavonoids protect the brain by releasing antioxidants, chemicals that combat the free radicals that erode the very structures of neurons and interfere with neuronal connections. The result is improved memory and sharpened cognitive function. This is where the dark fruits come in. Blueberries or concentrated blueberry juice, blackberries and black grapes or grape juice with no sugar added, pomegranate juice, and similar fruits are all excellent sources of flavonoids. The darker and riper the fruit, the better. Some sources say that grape juice may be even better than red wine, since the alcohol in the wine can cause the beneficial antioxidants to break down faster than they would without the presence of alcohol. In one study, women who drank grape juice enjoyed the enhanced cognitive effects even after they stopped drinking the juice. Without the alcohol, the antioxidants remained in their bodies longer and kept working. Flavonoids are also known to have anti-inflammatory properties. Although the dark berries and grapes are some of the best sources of flavonoids, other tree fruits such as citrus fruits, apples, pears, plums, peaches, apricots, and even bananas contain variations of these helpful phytonutrients.